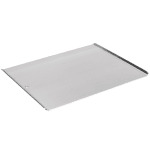 The Vollrath 68085 cookie sheet, which can be used in commercial and residential kitchens, measures 17 inches long and 14 inches wide. 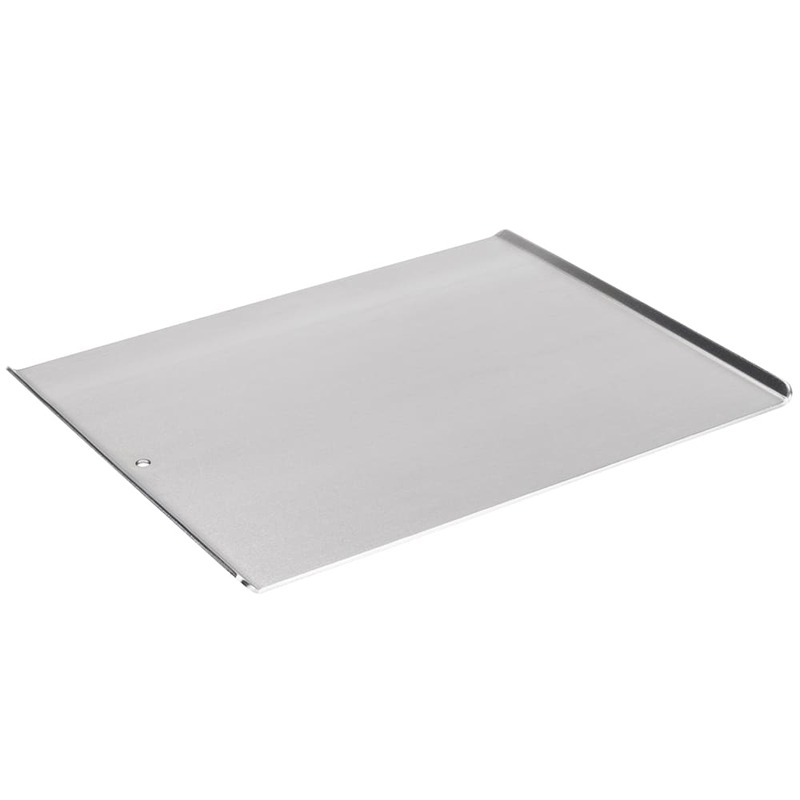 Constructed of 10-gauge 3004-series aluminum, this thick, heavy-duty cookie sheet provides even heat distribution and resists warping. NSF-approved for sanitation, it is given a natural finish, which is smoothly polished. The baking sheet also includes a hole on one end for hanging storage. "This is a really well made cookie sheet. Unfortunately, the size listed is incorrect. The full length of the sheet, including handles, is closer..."
"These are hands-down the nicest, thickest cookie sheets I have ever laid eyes on, and since they're aluminum the weight is pleasantly substantial..."
"Perfect size and cookie sheet I have been looking for. Much heavier than I expected. Now I understand why I could not find it for about $10!" "This is a really well made cookie sheet. Unfortunately, the size listed is incorrect. The full length of the sheet, including handles, is closer to 17.75 inches. That extra three-quarters of an inch makes a big difference for those of us with small ovens." "These are hands-down the nicest, thickest cookie sheets I have ever laid eyes on, and since they're aluminum the weight is pleasantly substantial, not out of control. They were just shipped to my office, so I can hardly wait to get home and try them out!" Good product with a flawed end. "Cookie sheet arrived on time. I have baked 1 batch of cookies so far. Turned out well. Only flaw with the pan is that it was rough on one end. I used a metal file to smooth the edge. Not a big deal for me, but might be for someone else." Large, heave cookie sheet that handles well. "It's large, it's heave and it handles well due to the upturned edges (both sides)." "Perfect for the serious or occasional baker/cook. Professional quality. Priced right." The best cookie sheets I ever had! "Glad I got it through KaTom! Their price was the best, the package was neat and the product secure, and it arrived promptly." "Minimal edges makes cookies easy to remove. No warping"
"The product is great however upon arrival one cookie sheet had scratches and the second had a dent on the edge." "Arrived in rather flawless condition. Very thick cookie sheet. Will NOT warp or bend in the oven or when removed. Made in America. We used to make lots of things of this quality in America. This cookie sheet is a rare find. If you use it for cookies, you need to let it cool a little bit between batches, as it stays hot for some time when it comes out of the oven, because the metal is so thick. We use ours for cooking frozen pizza and frozen French fries. Worth every penny. Don't hesitate to buy one or two, you will not regret it." "saw this brand reviewed on TV"
You need no other cookie sheet! "Many years ago, I purchased my first Vollrath Cookie sheet and it was always the best of all the ones I had. I finally realized that I should use no other one (as they can't compare), so I was delighted to find and purchase a second cookie sheet. Honestly, you cannot beat the quality, reliability and affordability of this product! My cookies turn out perfectly every time. Thank you for making this available to home bakers like me." "Wash by hand You will never wear out this cookie sheet, in this life-time or the next two!! Kind of heavy"
"Real sturdy cookie sheet. Doesn't warp in oven"
"These cookie sheets are recommended by Cooks Illustrated. They are very sturdy and don't warp in the oven which means no weird cookies. I bought more because having good equipment makes a difference in how my food comes out." "Cookies cooked evenly and didn't stick." "Solid, heavy duty, bakes evenly, excellent price." Every kitchen should have these. "My special cookie recipe never baked so perfectly. The weight of the cookie sheet makes all the difference." Heavy duty, great job of baking cookies. "Wonderful baking sheet, you probably will need to increase the baking time by a minute or two." "Bought because of online reviews that this is best product available. This is heavy duty, commercial quality level cookie sheet. Son baked cookies on once. first batch when sheet cold 24 mins, second batch burned at 9 mins (didn't watch - as he thought did not have to remove until closer to 20 mins). Thick sheets retain heat WELL and some users have written about cooling them first with warm water followed by cold, before reloading dough as heat flattens out some cookies too thin. Seems inefficient. Going to try silpat see if changes. Bought 3 pans with idea to goof around cycling them all through, baking lots of cookies quickly. haven't used but once so verdict still out on heavy being useful in home setting." "These sheets generate perfect cookies every time. The surface heats exactly the same across the sheet. You get a nice crispy cookie. Something you can't get with the insulated sheets." "We are extremely avid bakers in our house. We had two cookie sheets that were over twenty years old. We simply needed another and wanted to give my brother a few for Christmas. We could not find the company who made the original sheets anywhere on line. Turns out that Vollrath bought the other company in the 1990"s, so they are making that cookie sheet. I have to say, they are even better than the original! Don't bother looking for any other cookie sheet - you've found the best." "Yes- this is the top-rated cookie sheet by Cooks Illustrated Magazine. But often, I don't agree with "best" ratings. In this case, I totally agree! These are "heirloom quality" cookie sheets, to be passed down to an appreciative cook in the next generation. KaTom offers the *absolute best* price on these beauties, [...] I've ordered these in pairs several times, including as gifts.[...]" "Purchased on recommendation of ATK. I use the cookie sheet for baked goods. It transfers heat well without the problems of non-stick and with parchment paper it stays relatively clean. The two opposing handles on either end make it easy to slide items off the tray as well as easy to turn in the oven. The only negative thing I can think of is that it wouldn't fit in the small ovens I've encountered in Japan and Korea... but I don't have to worry about that now :)"
"Spouse makes over 80 dozen cookies at Christmas. Also, great for full loaves of garlic bread for dinner guests. Easy clean surface and presentation is quality!" "I use the cookie sheets to bake cookies, artisanal bread, scones,and pizza." "After years of using any cookie sheet[...], I decided to order a Volrath product since I was so happy with their other products. These are much, much better quality than what I have seen elsewhere at big box or kitchen specialty shops, and these cost less. I've used them several times, and believe that they will last a long time. Heavy, solid construction. Very happy with purchase." "a baking sheet that should last a very long time." "I make very thin linzer cookies, so I have to roll out the dough on the sheet and remove the excess. Since these cookie sheets are thick and sturdy, I can get an even thickness - no sagging in the middle. The best part is how evenly the cookies bake, from the edge to the middle of the sheet. It makes my labor of love a little less laborious and more joyful. I am so happy with them, I ordered a whole bunch to give to to Mom and friends, and more for me of course!" "These cookie sheets were highly recommended on cooksillustrated website which is why I purchased them. These are the best cookie sheets I've ever used- I don't think you can burn cookies on these sheets even if you tried. I highly recommend this product! The only downside in my opinion is they take longer than average to cool however that problem can certainly be solved by purchasing extra cookie sheets! I also highly recommend ordering from Katom- [...] the best prices!" "I got the recommendation for these cookie sheets from Cooks Illustrated and they were right; the cookies come out slightly crisp on the bottom and moist on top...a wonderful combination. But, you have to adjust your cooking time to account for the heft of the sheet. They take longer to heat up and seem to never cool down between uses. I'm glad I bought three to rotate. Also, you can use parchment paper to prepare the cookies and put them on a warm sheet. The problem is is that by the time I've figured out the correct cooking time, the batter is almost gone. It could be a learning curve. I've used them three times for cookie recipes that yield only 2 dozen...not a lot of time to figure out the cooking time. One time I got it right though (in a 4 dozen cookie recipe) and the results were great. I'll keep on trying since I had to throw out my old pans." "These cookie sheets had the highest rating from a well-known, no-advertising cooking magazine, and KaTom had the best price." "This is an excellent cookie sheet; I bought a second after using my first for a year. It's sturdy, so it doesn't warp. It's silver in color, so it doesn't burn the bottom of the cookies. It isn't non-stick, and so it takes a bit more effort to clean unless you use parchment paper, but it's not a problem in any case." "I have been baking for 40 years and wish I had these cookie sheets when my kids were young and I baked a lot of cookies. These are the best I have ever owned. No twisting and warping in the oven and cookies are perfect." "This cookie sheet is built really well. It's retained its shape after months of steady cooking, and I haven't had any problems with its heating distribution. The only cons, and they are slight, would be the hole-punch on one end (seems unnecessary), don't put it through the dishwasher--or at least don't let it sit and dry in the dishwasher. I did this and it left the sheet with a cloudy and smeared finish. It hasn't affected the performance, but it certainly doesn't look as appetizing to cook on anymore. And finally, i wish the rims were a bit higher so I could grab it better with mitts on. Again, the cons are limited, and the pros outweigh them immensely. A strongly recommended sheet." "Cookie sheets. Sheets are very heavy;; so I assume they will hold up lots better than the ones I've owned over the years. So far I have made chocolate chip and oatmeal raisin cookies on them. They have come out well and the sheets clean up easily."